Roger Federer , the defending champion at Melbourne survived an early exit as Giles Simon pressed the mighty Swiss to limits , atlast able to secure win by 6-2, 6-3, 4-6, 4-6, 6-3 in the second round match. After taking 2-0 lead, Simon changed his gears and went on taking the next two sets, hence pressurised Federer to produce something of substance to let his chances going into retaining his title.Taking his earlier two encounters into play Giles Simon has beaten him, and it was looking as if Federer would just be taking a ticket back to Switzerland. This also would have been the first time since 2003 he would have been ousted in a Grand Slam , last time being the 2003 French Open . 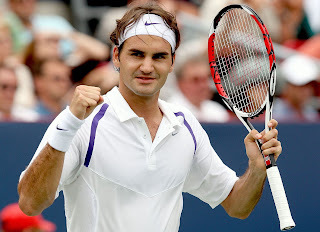 But despite all, Federer kept his nerves strong , and kept his fist pumping as he went on to win final tense games. Finally he was able to break Simon's serve at 4-2, ultimately sealing the Frenchmen fate on a 6-3 set loss. "I remained positive ... it paid off. I got lucky. I'm happy I'm still in the tournament," said the relaxed Federer. "It's going fast, he's moving fast, it's just impressive," Simon said. "There are not too many players able to play to this level."